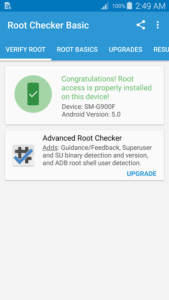 Every Android users have big problems about how to know whether your Android device has successfully rooted or not.We can root our Android Device using varies methods but finally every methods make root access to your Android device.Anyway, So in this post, we are going to share working tutorial to check if android phone is rooted or not. To know if your device is rooted or not, first of all Download and Install Root Checker app. Now,open Root Checker app now & click on Verify Root button.At that moment you can see it as given figure. 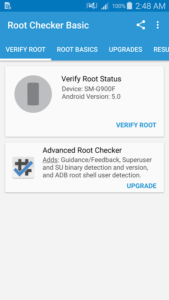 Now wait for some minutes as it will check if your android phone is rooted properly.Generally,most one click root tool will automatically offer Superuser App after rooting.it means that you can see Superuser App in the App drawer on your Device. If you android phone is rooted successfully then it will show that Root access is properly installed on this device. So, this is easiest method to verify root access of your android phone. Though, you can also verify root access by installing any root app. As, after you will open any root app a pop up will ask if you want to grant root access to that app or not. But still this app is best to check root access as if there is problem with any su binaries of your android phone than you can give a try to this app as it will list problem too.